Call for more information or submit an information request. We build learning programs which increase the efficiency and effectiveness with which your employees do their jobs. Everyone may say this, but the difference is that we have actually done it for over 20 years! Learning that transfers from the classroom to the job is serious business. It takes more than catchy marketing phrases, or the latest fad. It takes our proven Integrated Approach to learning design and development. The more efficiently and effectively your employees perform their job duties, the more capable and competent your workforce becomes. A capable and competent workforce translates into a more efficient, capable, and competent organization. And that means your organization has a greater competitive advantage in the marketplace. ALESYS provides a total solution -- from Needs Analysis through Measurement. 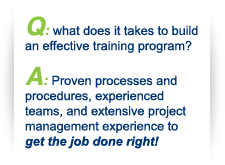 We have the experience and know how to get the job done whether it is a 45 minute e-Learning program or a 7-week new hire, Facilitator-led training program. So if you are ready to transition from training to learning and performance improvement on the job, ALESYS is your total solution. What makes ALESYS-designed programs so powerful is our proven instructional design process. We call it Designed for LearnabilitySM and it gets results in any medium or format, on any type of content, for any level of Learner. All programs designed by ALESYS bear the seal Designed for LearnabilitySM, which is our assurance to you that your program has been designed and developed to achieve maximum learning. It is our Guarantee to you of a quality-built learning program. We will accomplish your learning objectives and exceed your expectations. We understand your business issues and the complexity of the many things going on around you and your organization. Our Teams are experienced in working with you, or your subject matter experts, to minimize your time commitment so you can focus on other business issues. We know what we're doing! We know how to get the job done quickly, even with limited access to your team or subject matter experts. Our proven process for designing programs for Learnability is one of the components of ALESYS Integrated Approach to Learning®. This approach ensures that your learning content will be successfully transferred to job application. To learn more, contact one of our Account Managers at 1.800.758.1071, or email our . CourseBuilder, Camtasia, Authorware, Director, etc. Click here for more information about our e-Learning capabilities. We develop thorough and interactive training for any industry, from new hire training through highly technical and soft skills training. Our powerful process works very well in any media or format and for any level of Learner. 8-week technical training program for new hires of a major financial institution, shortening and strengthening it. We developed a 2-day coaching skills program for the Sales Managers of a major telecommunications company. We designed and developed leadership materials to accompany a Customer Service training video for a health care conglomerate. We created self-study materials for new Managers on critical leadership topics. We developed a highly technical 5-day Facilitator-led program with online self-study components for the Engineers of a major telecommunications company. We developed a problem-solving teaming program for a major training vendor to resell. We developed many soft skills e-Learning programs and Facilitator-led programs. We developed a 3-day Customer Service program for the medical industry for a major training vendor to resell. Like to learn more about how our Custom Training Design can improve the performance and business results of your organization?